Monday’s ad is for Rheingold, from 1959. 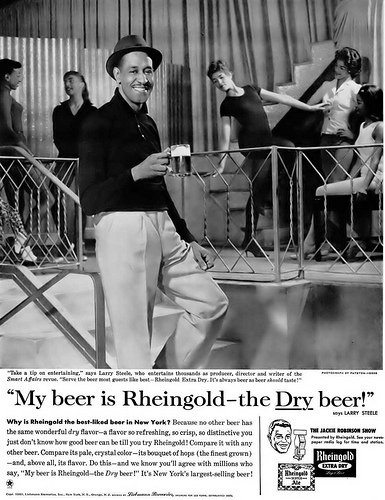 In the 1940s and 1950s, Rheingold recruited a number of prominent celebrities to do ads for them, all using the tagline: “My beer is Rheingold — the Dry beer!” This ad features Portuguese-born Brazilian samba singer, dancer, Broadway actress, and film star Larry Steele. There’s not much I could find about him, but he apparently produced a well-known traveling show from 1946-1971 called “Smart Affairs.” In this ad, Steele is holding a glass of Rheingold Extra Dry and giving us tips on show business.